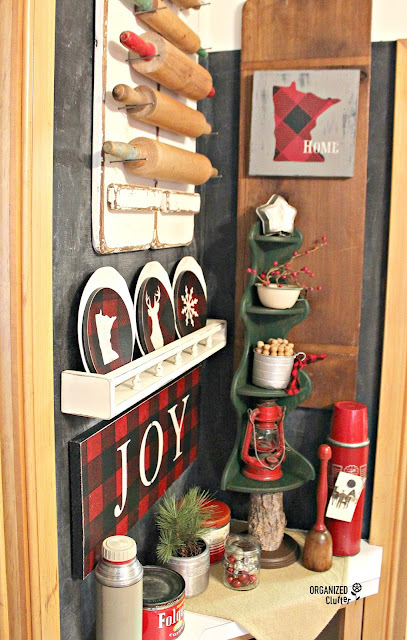 I started Christmas decorating today using some of my recent projects in the kitchen! 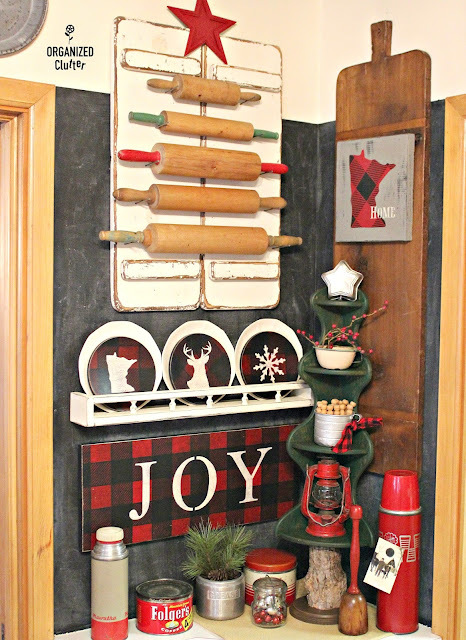 My new vignette includes projects with Minnesota and Buffalo Check stencils! My wooden corner shelf/Christmas tree project is here too! 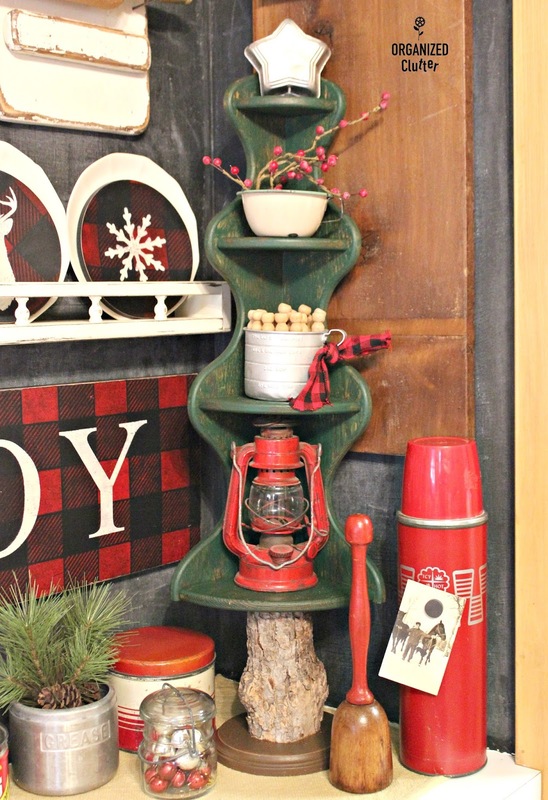 If you can find a corner shelf (at the thrift shop), a small tree trunk and a wooden base, you can make a repurposed tree like mine. 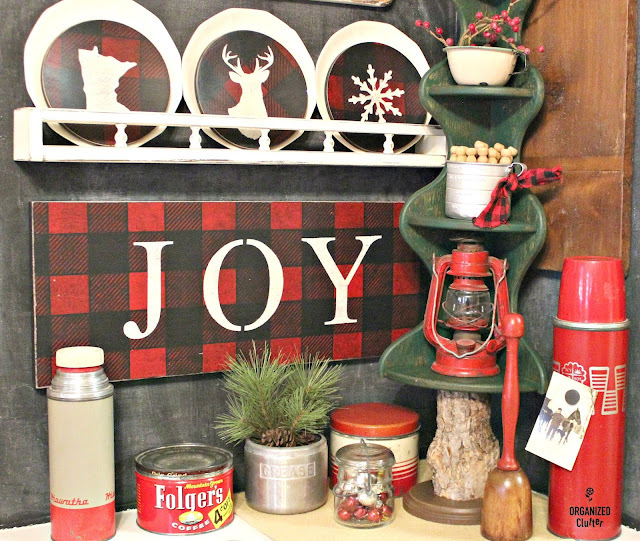 My buffalo check JOY sign and the Minnesota HOME sign are also included in the corner shelf tree post. The Buffalo Check stencil is available at *Old Sign Stencils. Believe me, you will get your money's worth on this stencil. I have stenciled tables, desktops, signs, pails, bookends, and burlap! I added my red vintage thermoses, tins, enamelware, and lantern. 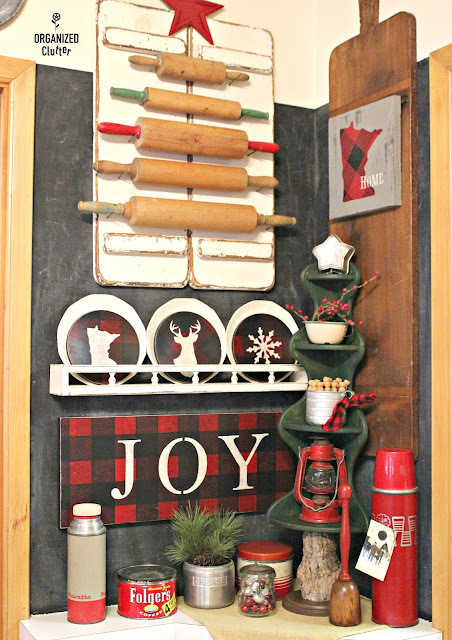 My thrift shop stenciled plate post is here. A typical Organized Clutter Christmas vignette, vintage and cluttered in a good way. Love, Love, Love this display! How creative! Great display Carlene. I need to get that Buffalo Check stencil. I was curious about that long "cutting" board and looked back in your blogs to see if you had blogged about it. Is it made from an old ironing board? Happy Holidays and Merry Christmas. I am so envious of your collection of rolling pins! They look so cool mounted on the wall like you have them. 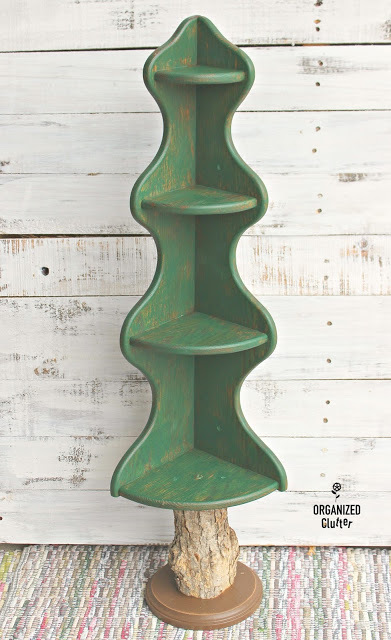 And what a great idea for the little green shelf. It really does look like a Christmas tree! And the buffalo plaid sets it all off perfectly! Hope your holidays are happy ones! WOW! I just love this Carlene! You did a wonderful job of putting everything together! 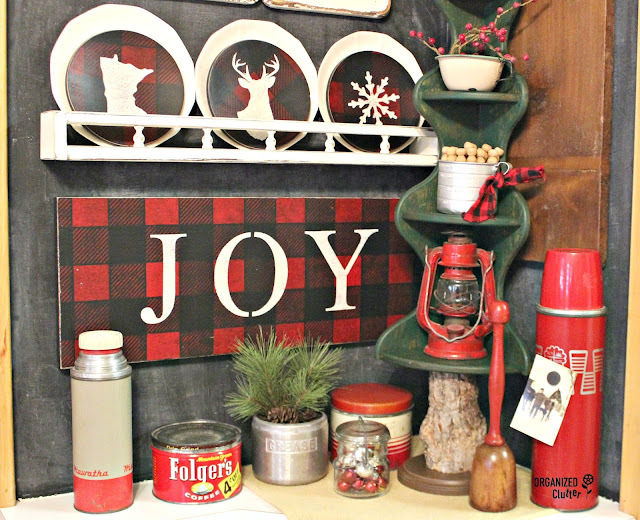 I just love the tree shelf! I hope you had a wonderful Thanksgiving! We went to Florida for a week to spend the holiday with family.